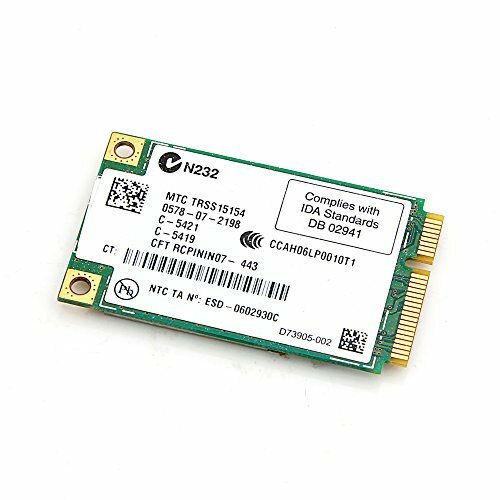 The Intel® Wireless WiFi Link 4965AGN product is an embedded 802.11a/b/g/n¹ PCIe* Mini Card network adapter card that operates in both the 2.4GHz and 5.0GHz spectrum. Intel Wireless WiFi Link 4965AGN provides deployment flexibility and connectivity convenience by offering a quad mode (supporting 802.11a/b/g/n) product, which is capable of connecting to new "Connect with Intel® Centrino® processor technology" wireless N Access Points / Routers, but can also connect to any of the legacy Wi-Fi standards, 802.11a, b or g.
Data rates up to 300Mbps offer major improvement over today's 802.11a/g products that deliver 54Mbps. MIMO, diversity and three antennae support enable better wireless reception for greater bandwidth at farther distances. This card will work with most of the newer laptops. It works ONLY with the notebook . Plesase make sure that your computer has :Mini PCI-E internal slot. Dell Core Duo laptops or NEWER. If you have any questions about this product by Dell Computers, contact us by completing and submitting the form below. If you are looking for a specif part number, please include it with your message.